Australian firm EarthWorker has launched a series of solar hot water systems, which it says will save money, cut emissions and protect local jobs. EarthWorker is a cooperative company working to provide sustainable jobs to foster Australian industries and workers, with a strong focus on local suppliers and customers. Their latest product is made at the worker-owned Eureka’s Future factory in Victoria. The Bolt-On Solar Heat Pump and Tank system is designed to produce hot water for almost any residential or small-medium commercial settings. The company says it helps take a big slice out of the major costs on energy bills, saving some customers hundreds of dollars per year. The Bolt-On design is light and portable, required no permanent installation fixings. It can be supplied with help from a special fixed low interest loan from the customer-owned lender bankmecu, and can be retrofitted to most existing hot water storage tanks. The system uses a reverse application of the technology found in household fridges, utilising ambient heat in the air around the unit. 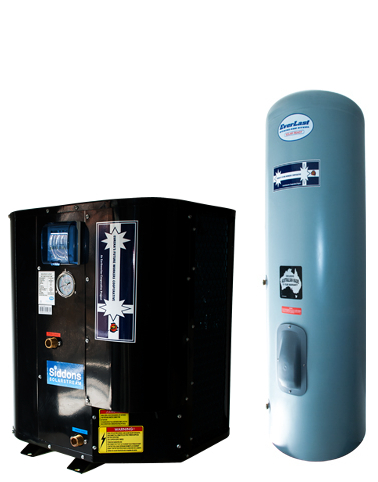 The unit contains a refrigerant that boils at -26°C, becoming a gas which can be compressed. The Bolt-On uses a small amount of electricity to run a compressor, which forces the gas to superheat up to around 95°C. This heat is used to heat hot water. The system runs with considerable efficiency, around 1kW/h of power yields 3.6 kW/h of heat at 20°C. Efficiency also rises by more than 20% for every 10°C rise in air temperature. The systems will be built at the Eureka’s Future Worker’s Co-operative in Morwell, in Victoria’s coal-dominated Latrobe Valley. A series of partnerships with small local and family businesses has allowed the company to continually train workers in the necessary manufacturing skills, as well as raising money for new factories and expanded efforts.